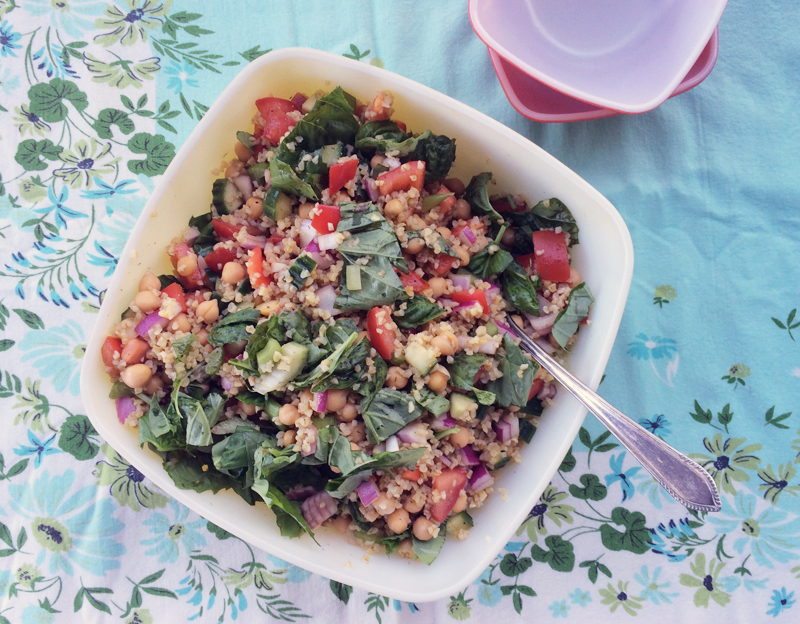 Salads that double as a meal are what I tend to eat come summertime. They should be hearty so you’re not left feeling hungry an hour later and they should be filled with the bounty that summer provides. 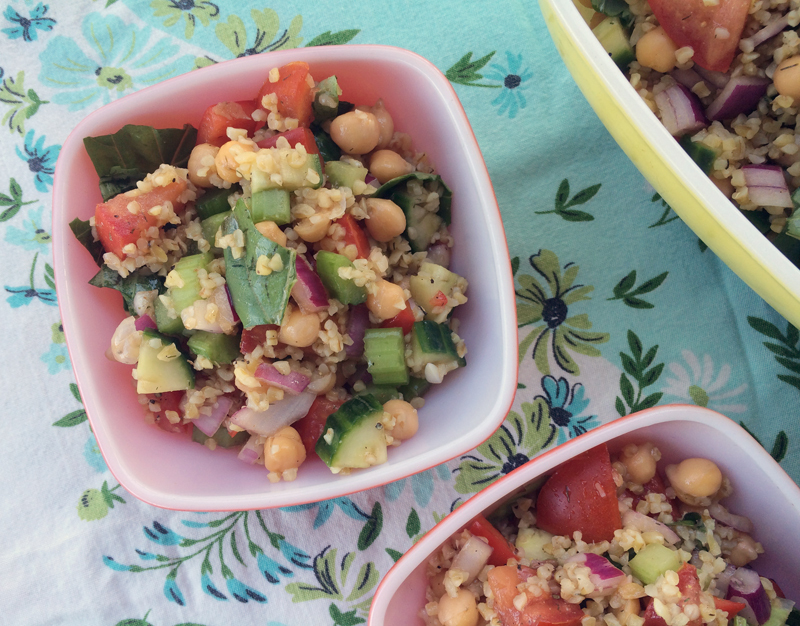 This bulgur salad is just that kind of meal. If you’re having friends over for a barbecue or are looking for a dish to bring to a summer potluck, look no further. While this is a great side dish, it’s fantastic as a meal. I love it because it’s easy to whip up too. Sure, there is some vegetable chopping to do, but pour yourself a beer, put on a podcast or your favourite summer jam and get to work. It’s mediative, it’s joyful…clearly I love chopping vegetables and maybe you do too. And really, there’s not that much going on here – just some red onion, cucumber, tomatoes, peppers, and celery. There is lots of fresh basil, but that’s easy, you just tear it up in a bunch. It’s rustic and so flavourful. Don’t forget the chickpeas! They add bulk and protein. The bulgur might require some planning, but I used the quick-cooking stuff that I found at Trader Joe’s last time I was in the States. Or you could spend your Sunday mornings cooking up grains and then using them throughout the week in salads. It’s a little Sunday pre-planning that makes meals during the week so much simpler. The dressing is a simple mixture of balsamic, white wine vinegar and olive oil but seasoned with dill (sadly I only had dried, but it worked out beautifully, regardless) and the magic earthiness of cumin. Toss everything together and enjoy your summer meal. Leftovers are tasty the next day and make for a perfect bring-to-work lunch since there’s no need for refrigeration and nothing ends up limp or soggy. 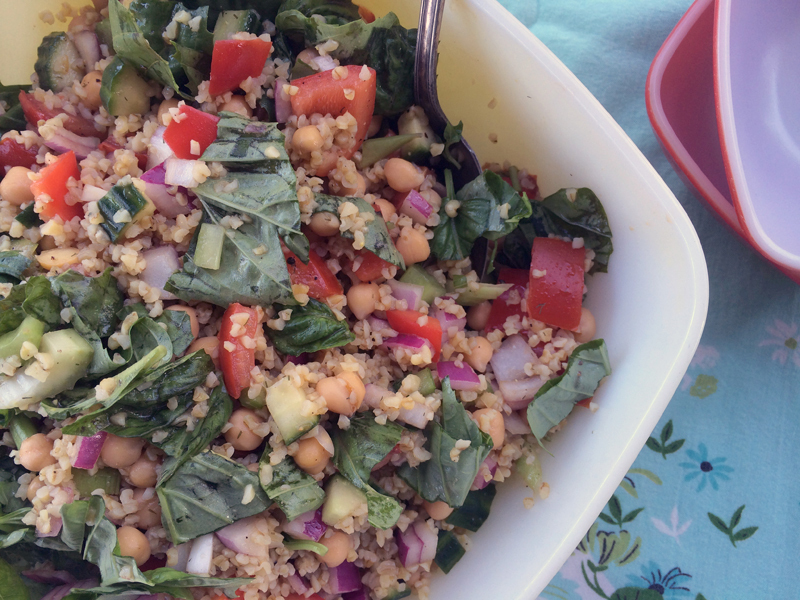 And do I even need to mention that this salad is perfect picnic fare? Prepare bulgur according to package directions. Set aside. In a large bowl, combine the tomatoes and onion with the vinegars, oil, cumin, dried dill, salt and pepper. Let marinate for a good 15 minutes to help mellow out the onions before adding in the cucumber, celery, red pepper, and chickpeas. Stir in the cooked bulgur and mix well to combine. Taste and adjust seasoning, if needed. 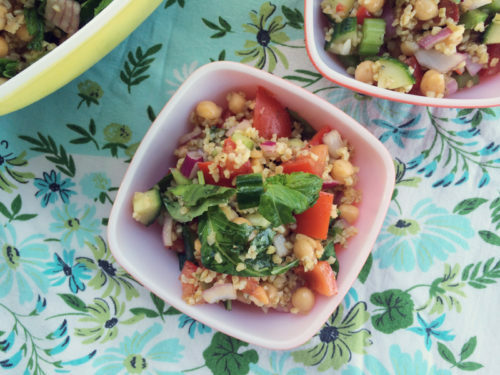 All these fresh flavors and veggies definitely sound like a perfect summer picnic food to me! I enjoy chopping veggies, I find this so relaxing. Anyway great combination of flavors and love the fact you added cumin to your dressing. Sounds delicious! Yes, Sues!!! That’s it. I love it – eating something so good for dinner and getting to eat it all over again the next day. BEST. You are good with salads! Now I have 2 delicious salads to look forward to making and eating…this one and your easy-chickpeasy tuna salad from the other day! I like that they look like they can be made ahead, too. This is exactly the kind of thing I want to eat for lunch on extra-hot days! 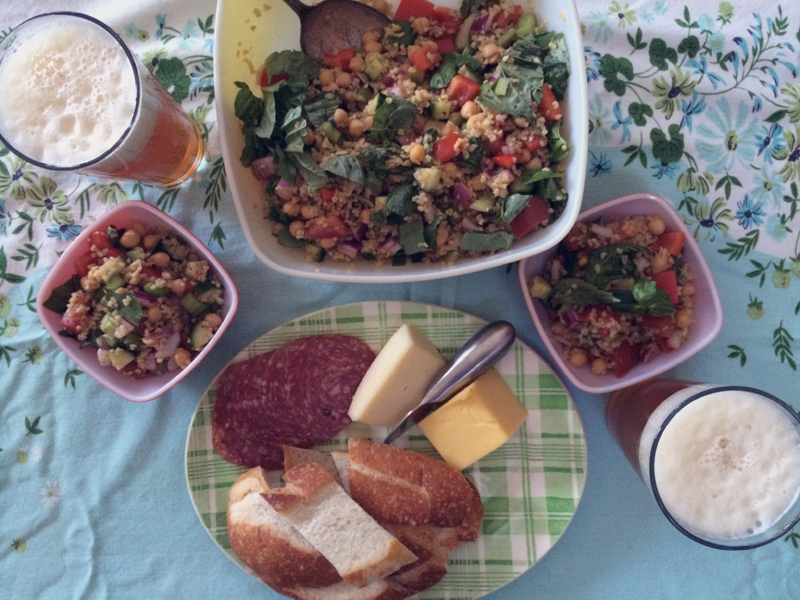 So cooling and delicious, and super full of hearty grain and vegetables. I make a lot of salads as well in the summer months. Love everything about this one! Yum! 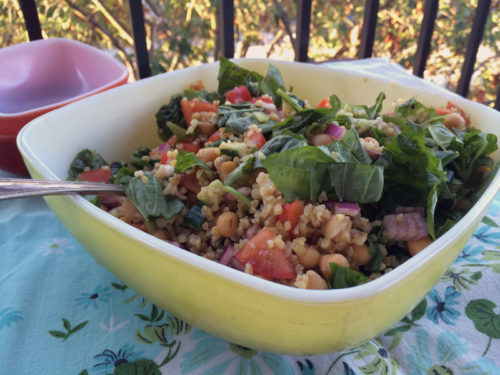 Thanks Marianne A – I do love a good salad, especially in the summertime. I hope you try it out, Joanne!